If you're going to draw mainstream comics, you have to be able to draw the human figure. You also have to be able to draw guns. I tend to use the same pistol over and over again: the Colt M1911. 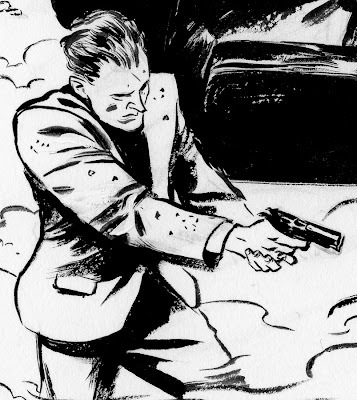 It's a great gun for a number of reasons specific to the comic book artist. First of all, it's old, yet it hasn't changed much in the last century (1911 refers to the year it was produced). Second of all, it's a well designed gun and, therefore, widely used by many different people and organizations. Finally, it has a recognizable silhouette that is both easy to draw and beautiful in it's own way (neglecting the intended purpose of the machine). 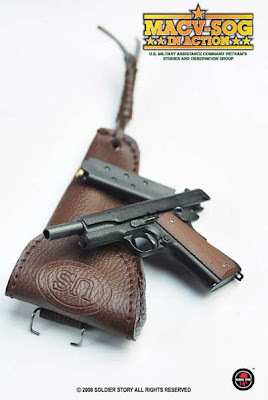 Because of these characteristics, the M1911 is appropriate to use in any number of situations, from a police shoot-out with drug dealers to a WWII battle. It may not be exactly what may have transpired, but it's well within the realm of possibility. I have two 1:6 scale models that are decently proportioned, but I recently bought an additional one with an unprecedented level of detail. Not only do the ammunition clips detach, but the cocking action is mimicked as well. The gun is produced by Soldier Story and pictured below. They don't package the guns separately, but it's easy to find them for sale on ebay as loose parts. Another great reference is YoutTube, where you can see the gun in action. 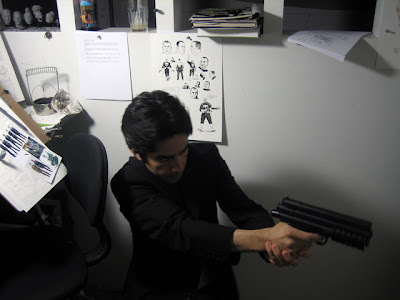 Since the comic artist usually draws these guns being used, it helps to have some background in their basic operation. But before I go, where would we be without a "wacky" reference photo? 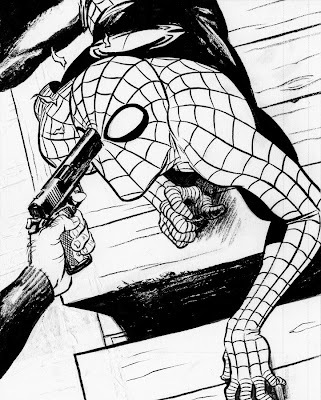 Here I am posing as a drug dealer in Amazing Spider-Man #577. I'm holding a paintball gun that I've only shot a couple times. i´m always amazed at the amount of photos you take. do you make thumbnails, photos and THEN go drawing or do you take photos when coming to an uncertain place in your drawing? im a big fan of your inkwork! Haha Be careful where you point that thing! LoL Yeah I've been so surprised on how youtube has developed to be such a great tool for reference. I'm currently working on a dinosaur comic for David Mazzucchelli's class and even though the Jurassic Park movies are great, they don't explain a whole lot on how the mechanics of dinosaurs work. Thats when I can catch missed episodes of National Geographic documentaries on youtube. P.S. I'll be attending the BP Library Lecture so see you there! I recently picked up the Mythos trade and just wanted to state my appreciation for your incredible artwork. Your combination of realiytic lighting and rendering along with the stylized characters and cartoonish moments is really a class of its own. The amount of thought and preparation you put into the pages makes Mythos one of the top inspirational books for my own work. I tend to make thumbnails first, which then serve as a shooting guideline. Occasionally, I'll take a photo during the sketching phase if a particular pose is giving me trouble. I find that happens most often with hands... but, as always, it gets easier with practice. Manny, I hope you're taking full advantage of David's class. Having him as a professor was one of the formative periods of my comic book life. I hope to see you at the lecture. Anjin, thank you for the kind words. I'm always happy to hear that people recognize the amount of consideration that goes into each page. Thanks, Emma. I know it's just because you're such a gun proponent.